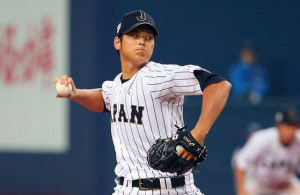 With Japanese sensation Shohei Ohtani set to be officially posted as early as Friday, teams across baseball are preparing pitches to convince him to sign with them. One surprising contender for Ohtani’s services could be the Minnesota Twins. While the Twins aren’t typically big spenders in free agency, Minnesota GM Thad Levine said over the weekend that the team is making Ohtani a priority this offseason and will be all-in on trying to sign the most sought-after free agent on the market. Of course, it’s unclear what exactly Ohtani is looking for in a major league team. Some clubs have tried to increase the money available to them to sign international players. However, no team is going to be able to give Ohtani a signing bonus greater than around $3.5 million. The Twins are behind only the Rangers and Yankees in terms of bonus they can offer Ohtani at just over $3 million. But unlike other free agents, Ohtani is not all about money. Ohtani’s representatives have given teams a list of items to address in their pitches to Ohtani. First and foremost, they want to know how each team evaluates Ohtani as both a hitter and pitcher. Ohtani has the desire to play the field and hit on days when he isn’t pitching. His representatives are also asking for information on each team’s player development and training facilities, as well as a plan for how Ohtani could assimilate into the culture of a particular city as well as the organization he chooses. These are obviously unique requests for any free agent. Levine believes that helps put the Twins on level ground with the rest of baseball, which hasn’t always been the case with marquee free agents in the past. From Minnesota’s perspective, they can portray themselves as a team that’s on the rise and ready to win. After losing over 100 games in 2016, the Twins reached the Wild Card Game in 2017. The Twins may be able to convince Ohtani that they’re a young team ready to take another step forward next season. Of course, it would be even easier to take that next step with Ohtani in Minnesota. Of course, nearly every team in baseball is going to take a crack at signing Ohtani. But right now, there appears to be no favorite. That gives a small-market team like the Twins a fair shot at getting their hands on the top free agent available this offseason.